LooseLeaf, CNGA's member-only magazine, is published six times a year and features articles on the latest growing practices and business solutions. Each issue includes member company profiles, a message from the CNGA president, feature articles, horticulture updates from Colorado State University and event information. Advertising is available to both members and non-members. View the media kit and contact Katy Patterson for more details. Learn more about membership here. Plant guides are a great resource for you to provide or sell to your customers. The full-color guides aim to educate and empower your customers. Sold by the box only. To order any of the guides below, click here to order online or download the order form. Rocky Mountain Plant Guide - BEST SELLER - This 45-page catalog describes plants that are commonly used in horticultural applications in the Rocky Mountain region. It features color photos and descriptions that provide detailed information on growth characteristics, habitat requirements, appeal to insects and birds, water usage and a section of general planting guidelines. The guide includes categories for evergreens, deciduous trees and shrubs, perennials, fruits, grasses & water plants. 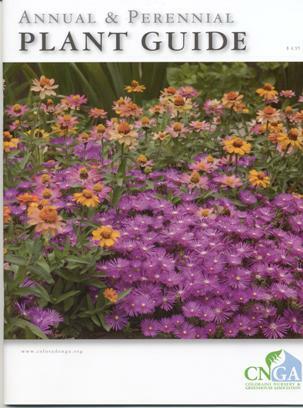 Annual & Perennial Plant Guide - This 60-page booklet will help Rocky Mountain homeowners and gardeners select annuals and perennials that will be successful in their landscape. You can also use it as a handy reference and training tool for your sales staff. Along with many color photos, it provides a description of each plant's water needs, sun/shade requirements, foliage value, suitability for cutting and drying, high elevation adaptability and attractiveness to insects and birds. 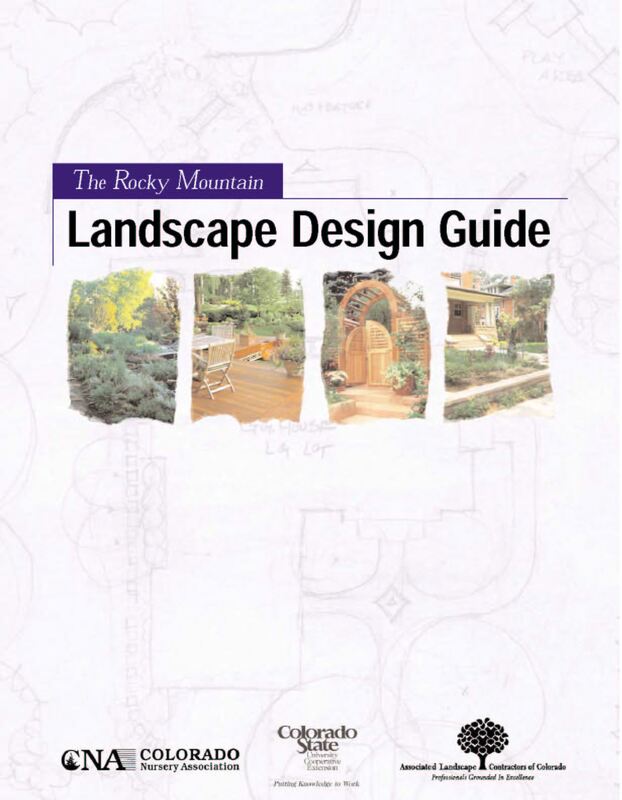 Rocky Mountain Landscape Design Guide - This guide is designed to help consumers understand and visualize various landscape designs and scenarios. It serves as a helpful tool for green industry professionals to assist homeowners with landscape design, plant selection and maintenance. Well illustrated pages include sample layouts, photos, various lot size configurations and a brief description of landscape essentials to consider such as soil preparation, irrigation, mulching, lighting and more. 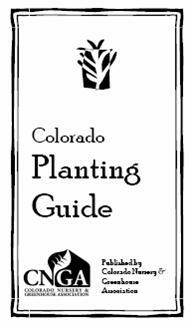 Colorado Planting Guide - A handy booklet that provides accurate, easy to understand information on how to properly install and maintain trees, shrubs and perennials. It includes illustrations that show the important details for planting container stock, perennials, bulbs, container and packaged roses, and balled and burlapped trees. Instructions for watering, fertilizing, and fall and winter care are provided as well. This guide is also available in a Spanish version. These supplemental learning aids can help you prepare for certification exams and serve as a useful resource publication. Click here to order online or download the order form. Colorado Certified Nursery Professional Manual - Use this study guide to prepare for the three-part exam. The manual covers plant physiology, marketing, entomology, pruning, weed control, plant identification, salesmanship, landscape design, and disease control. Certified Greenhouse Grower Manual - This study guide supplements the required classroom training and will help you prepare for the exam. It covers heating and cooling, diagnosing pests & pathogen problems, botany and plant physiology pests & plant disease, plant propagation, pest/disease, control water, common insects & mites, media plant diseases, nutrition, pesticides & use laws and regulations. 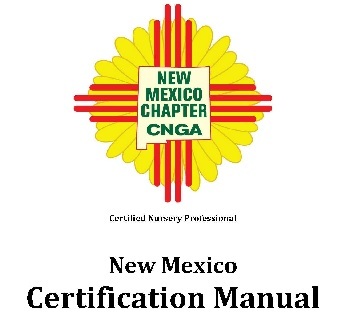 New Mexico Certified Nursery Professional Manual - In addition to general horticulture practices, this study guide also covers practices, materials and information that are specific to New Mexico and will help you prepare for the three-part exam. The manual includes chapters on plant physiology, marketing, entomology, pruning, weed control, plant identification, salesmanship, landscape design, and disease control. 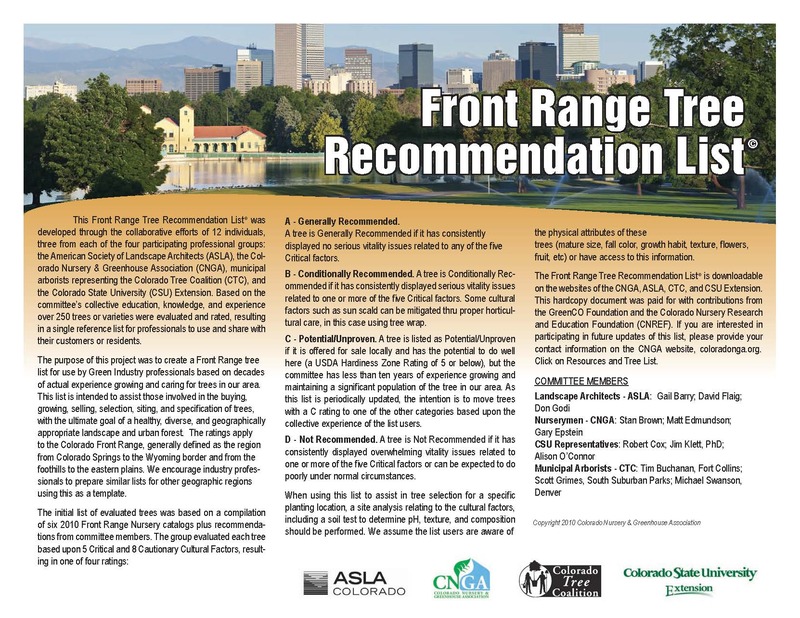 The Front Range Tree Recommendation List© was developed through the collaborative efforts of 12 individuals, three from each of the four participating professional groups. Based on the committee’s collective education, knowledge, and experience, more than 250 trees or varieties were evaluated and rated, resulting in a single reference list for professionals to use and share with their customers or residents.